Today's women are so comfortable in their authority that they often forget to credit the women's liberation movement of the 1960s and '70s for paving the wayfrom the kitchen to the boardroom, from sexual harassment to self-defense, from cheerleading on the sidelines to playing center on the team. Distinguished scholars and active participants in the movement, Linda Gordon and Rosalyn Baxandall have collected a colorful array of documentssongs, leaflets, cartoons, position papersthat illustrate the range of people, places, organizations, and ideas that made up the movement. 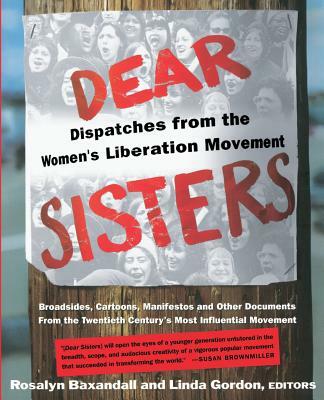 Dear Sisters chronicles historical change in such broad areas as health, work, and family, and captures the subtle humor, unceasing passion, and overwhelming diversity that defined the women's liberation movement. Rosalyn Fraad Baxandall is the author of Words on Fire: The Writings and Biography of Elizabeth Gurley Flynn and, with Elizabeth Ewen, of Picture Windows: How the Suburbs Happened. Linda Gordon is the author of The Great Arizona Orphan Abduction and Pitied But Not Entitled: Single Mothers and the History of Welfare.Rosalyn Fraad Baxandall and Linda Gordon first met in 1971 at a women's liberation demonstration and have been working together ever since. Both teach women's history at universitiesBaxandall at SUNY/College at Old Westbury, Gordon at NYUboth are mothers, and both eagerly await the new feminist revival.